It wouldn't be Halloween if we didn't spend some time at a Haunted House! Visiting a haunted house is a must for me every Halloween! As we all know, Frankenstein’s monster was created in a spooky laboratory and ghosts love to haunt places. 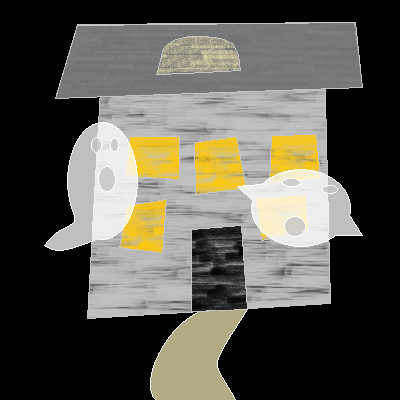 We would like you to show us your haunted house. Create a graphic or write a story, 200 word minimum, about your experience at a haunted house. My friend decided to bring up haunted houses a week before Halloween. “Well, will you go with me?” She asked all excited. I wasn’t so sure. I had never been to a haunted house before. Finally, I accepted the “invitation”. “All right, I’ll go, but I can assure you I won’t last long.” “Oh, come on! It’ll be fun!” She reassured me. That’s how I found myself standing outside of the spookiest house I had ever seen. My friend was ecstatic. “Let’s go!” She grabbed my hand and dragged me through the entrance. Inside, there were cobwebs everywhere and a creepy cackling sound that seemed to be emanating from the walls. I wrapped my blue sweater more firmly around me and proceeded on. Not far into it, a spider came creeping out from the ceiling and landed on my head. Later, we were chased by a skeleton that came walking down the hallway behind us. My heart was beating pretty fast. It was the last straw when a witch jumped out at us as we turned the corner. I took off down the hallway and past room after room not even noticing what was in it. I got outside and looked back. My friend would have to continue by herself. I turned around and began to walk away from the house only to have something clutch my shoulders and scream “boo!” I screamed just to turn around and find my friend there keeled over from laughter.